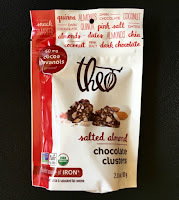 Today's Salted Almond Chocolate Clusters from Theo Chocolate (Seattle, WA) contained dark chocolate, almonds, quinoa, and...drum roll please...coconut. 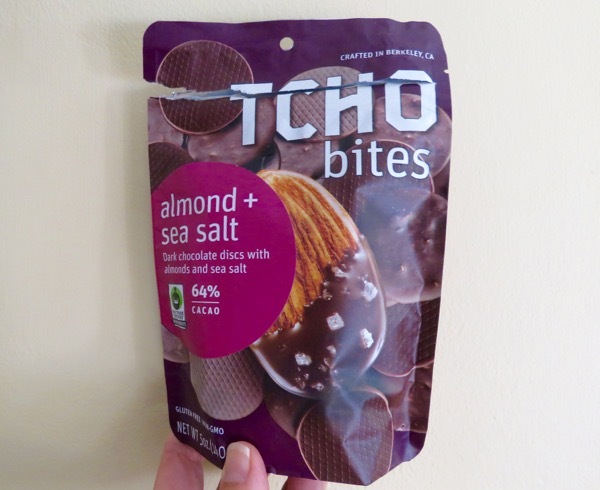 Not a bad flavor combination for a snack, and accented with a shake of pink salt. I could have done without the salt; but most people will like this blend. 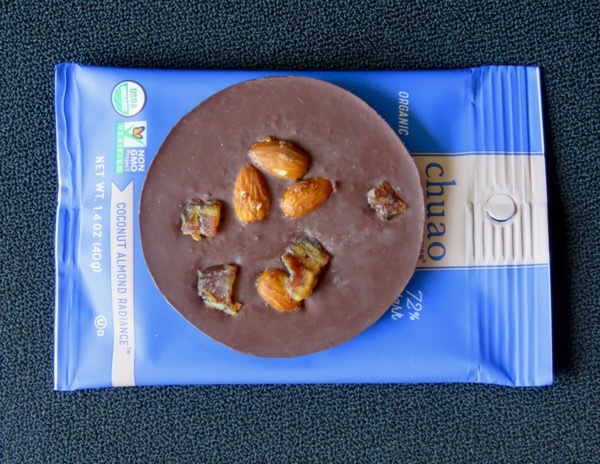 These small haystack-like, bite-sized chocolate rounds were certified Organic, Non-GMO verified, and made with fair for life ingredients. 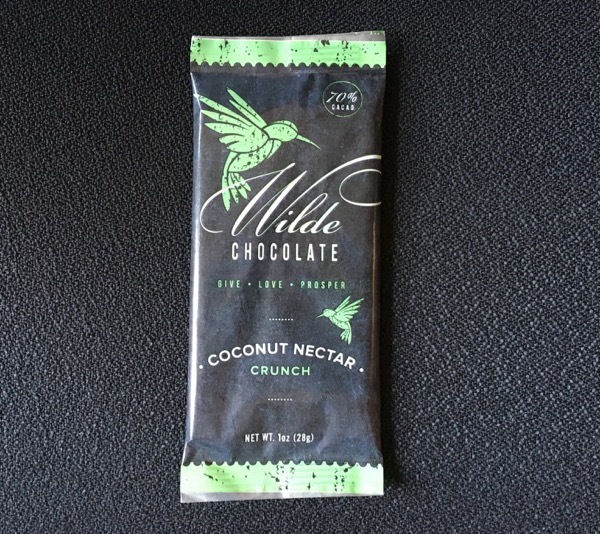 The coconut featured in this chocolate is not coconut "meat" or "cream," but rather coconut sugar* used as a sweetener in instead of refined cane sugar. Today's 70% Cacao Coconut Nectar Crunch bar was made with raw organic cacao and cocoa butter (giving the chocolate a relatively mild, dark flavor); organic coconut sugar and raw vanilla bean (yielding a pleasant crunchy texture with natural sweetness); and a touch of sea salt. 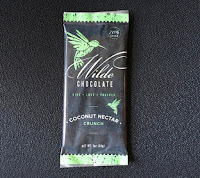 This dairy free, soy free, vegan and paleo bar was made by Wilde Chocolate (Santa Cruz, CA). *Coconut palm sugar (produced from coconut palm flower bud/stem sap) generally scores lower on the glycemic index and in a less refined form imparts a bit of natural sugar flavor. 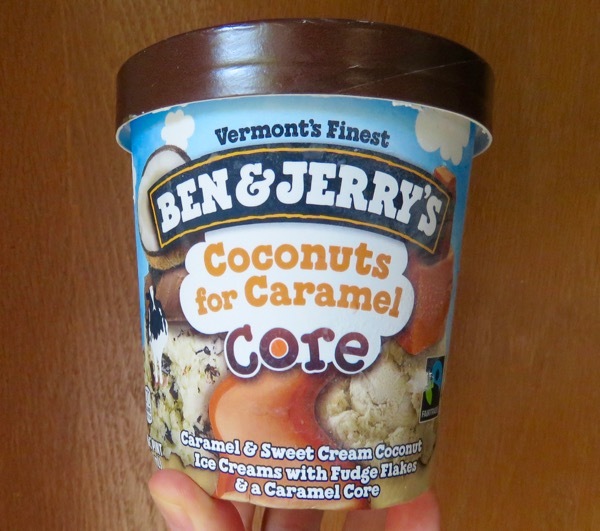 It does not generally yield a strong coconut flavor. 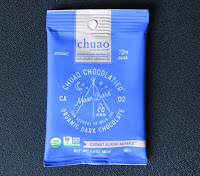 Today's Coconut Almond Radiance Organic Dark Chocolate Moon Bark was from Chuao Chocolatier (Carlsbad, CA). 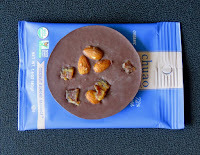 This disc- or moon-shaped chocolate had a slightly crunchy texture. 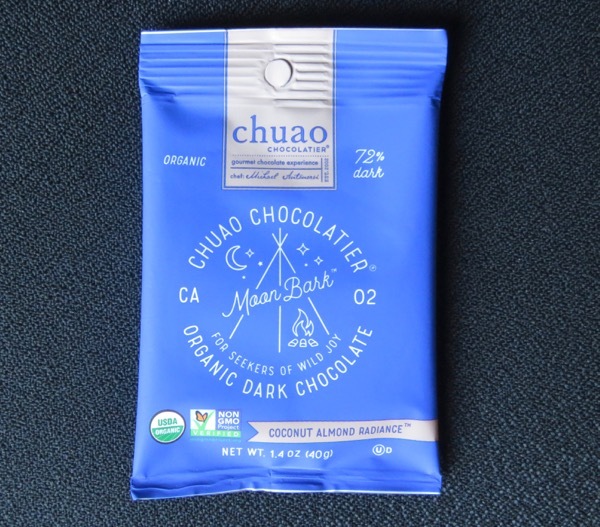 The base 72% (fair trade) dark chocolate was decorated, mendiant*-style, with toasted coconut, dates and salted caramelized almonds. On the flip side (not pictured in this post), the disc was scored into quarters, the following words appeared: "Moon Vibes Only." 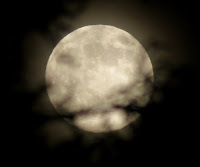 Coincidentally we were out last night admiring our wondrous summer moon; it was shining between branches in the backyard. What a treat. 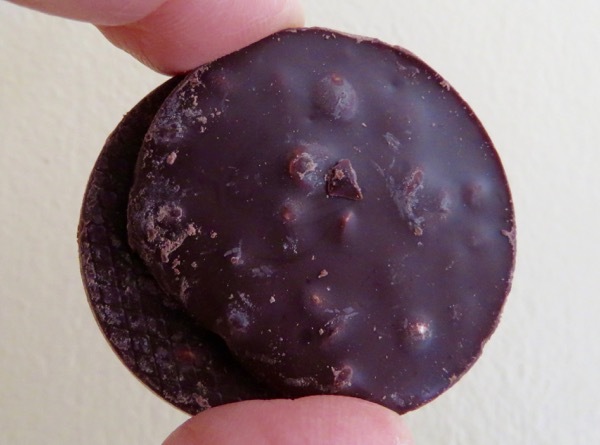 *A mendiant is a French-style chocolate confection, usually round and flat, with nuts and fruits pressed into or dropped/placed onto a cooling chocolate disc. Each inclusion was said to represent one of the monastic orders in France, and possibly to represent the colors of monks" robes. 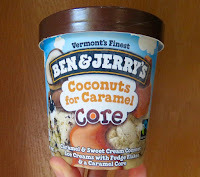 Today's Coconuts for Caramel Core Ice Cream was from Ben and Jerry's* Ice Cream (South Burlington, VT). Caramel ice cream and coconut ice cream—flecked with chocolate pieces ("fudge flakes")—surrounded a central well of golden brown caramel. 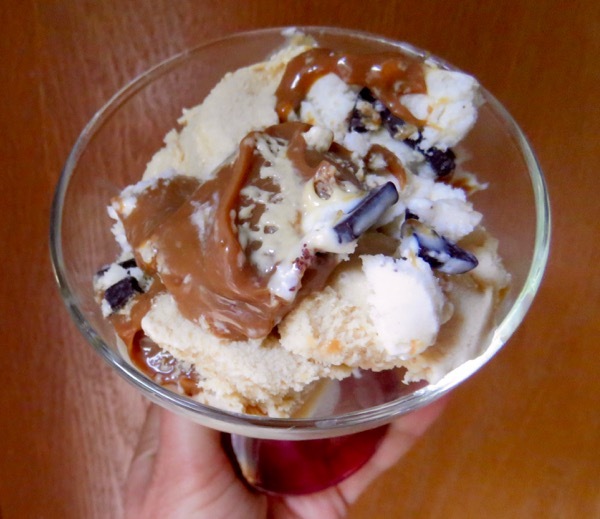 The combination created a built-in ice cream sundae. 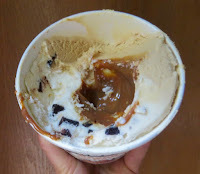 No flavors were particularly strong in this blend; and, in fact, the coconut flavor was fairly mild. *The Ben and Jerry's brand is owned by Unilever. 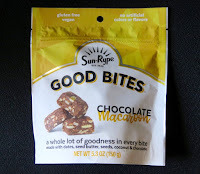 These featured Chocolate Macaroon Good Bites were from Sun-Rype Products Ltd. (Kelowna, BC, Canada). 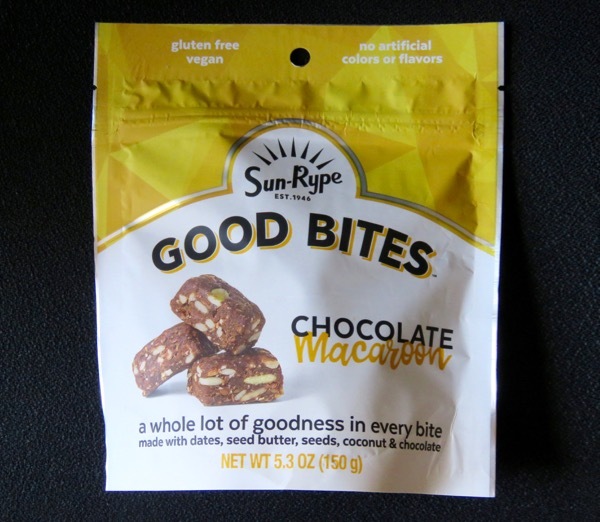 The company's roots date back to 1946, when Sun-Rype got its start in the fresh fruit and beverage (juice) market. Today's Chocolate Macaroon Good Bites contained dates, seeds (sunflower, flax, pumpkin, chia), coconut and chocolate and cocoa powder, with a touch of apple juice concentrate and sea salt. 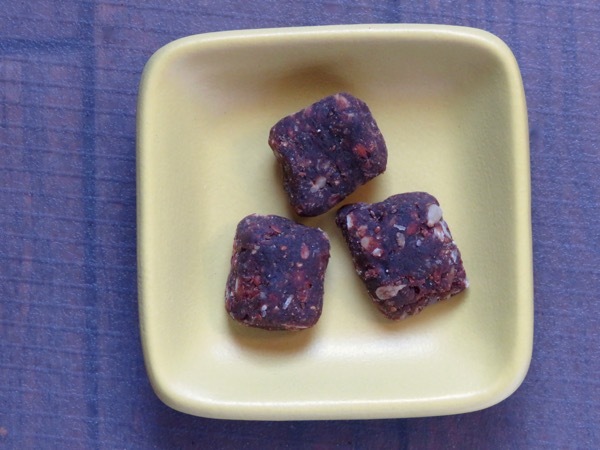 The chewy bites had balanced fruity chocolate and coconut flavor, and the softened seeds added a bit of texture. 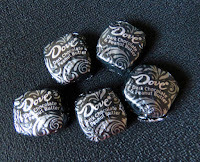 Welcome to Day #8 of Chocolate, Cherry and Berry Theme Week, and Day #1 of Chocolate and Coconut Theme Week. Today's Cherry Chocolate Chip Larabar Bites were distributed by Small Planet Foods, Inc. (Denver, CO). 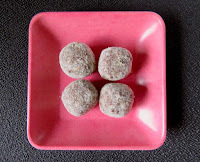 These soft, slightly chewy, balls of rich, fruity, chocolate and cherry flavor were gluten free, Non-GMO, vegan and dairy free. 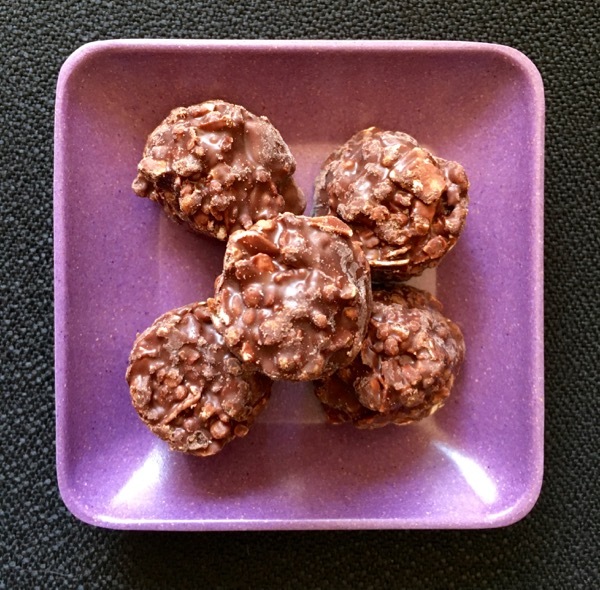 Made with a short, well-balanced list of ingredients (dates, almonds, semisweet chocolate chips, dried cherries, coconut flour, sea salt), these were naturally sweet and satisfying. 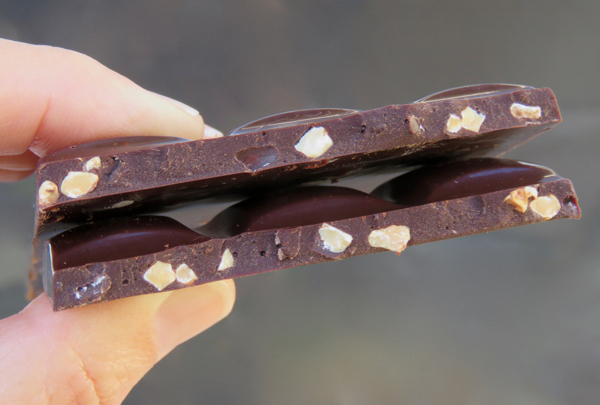 Welcome to Day #7 of Chocolate, Cherry and Berry Theme Week. This gluten free, Chocolate Raspberry bar was from Good! 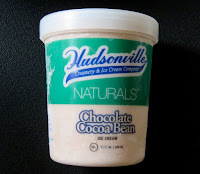 Nutrition, LLC (Cleveland, OH) contained fruits and vegetables, and 12 grams of protein (sunflower seeds, soy, peanuts). 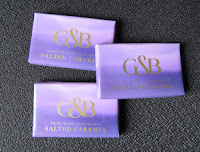 The flavor and texture of fruit, grain and vegetable constituents were more prominent than the chocolate. 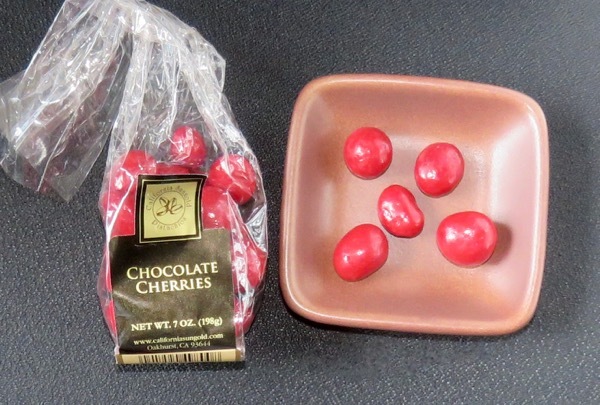 Welcome to Day #6 of Chocolate, Cherry and Berries Theme Week. 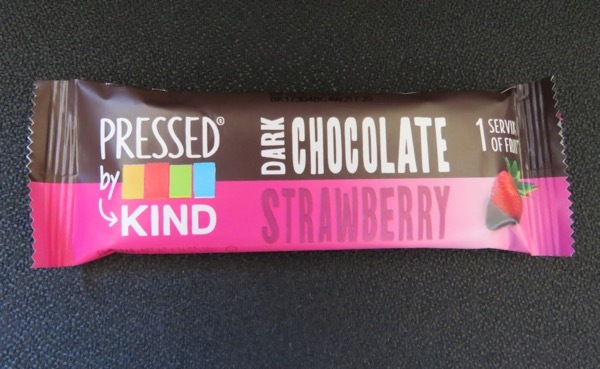 This Pressed by Kind - Dark Chocolate Strawberry bar was from Kind LLC (New York, NY). 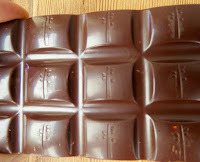 Welcome to Day #5 of Chocolate, Cherry and Berries Theme Week. 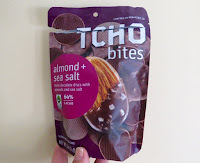 Today's small discs of dark chocolate with almonds and sea salt from TCHO Ventures, Inc. (Berkeley, CA) were made of 64% cacao and Fair Trade Certified ingredients. 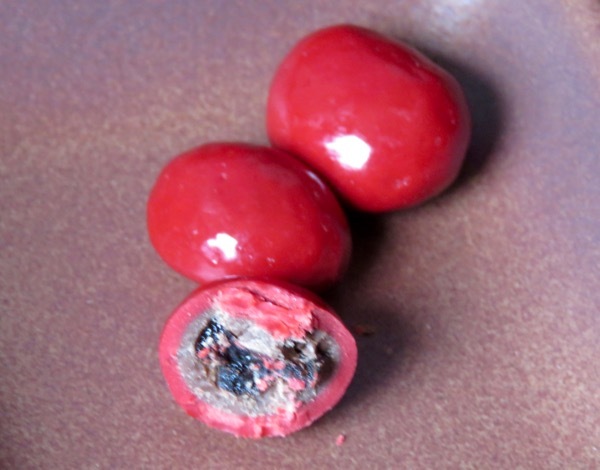 These discs were well-suited for experimenting with pairings with cherry and berry items. 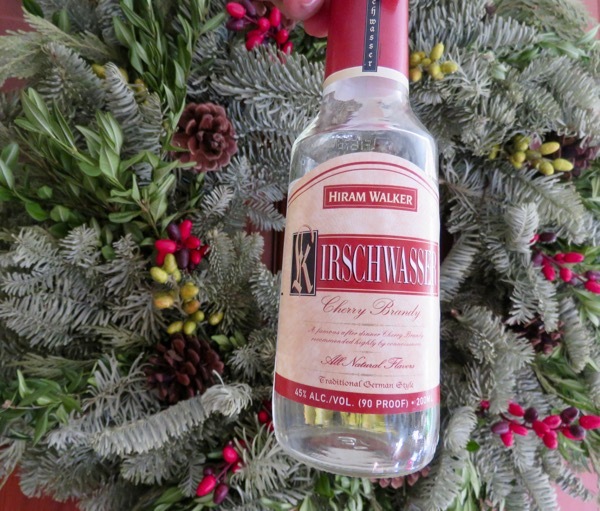 The first pairing was with a Kirschwasser (cherry brandy). 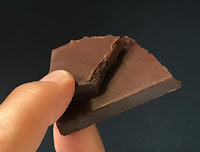 The alcohol and cherry flavor seemed a bit too much, and altered and "flattened" the dark chocolate flavor, giving it a slightly artificial taste. 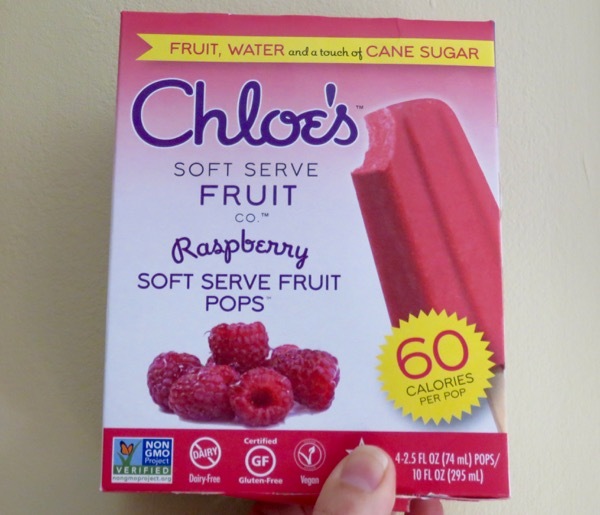 The second pairing item was a Chloe's frozen raspberry pop (raspberries, cane sugar and water). Also, not a great pairing, although both were good on their own. The temperature difference did not help. 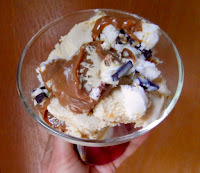 The last pairing was with fresh blueberries (not pictured). 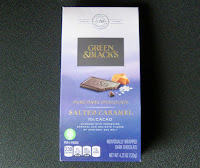 This worked the best of the three, but the dark berry flavor made this chocolate taste like milk chocolate (quite sweet) in comparison. These discs are fine all by themselves. However, despite the lack of success today, they do seem well-suited to pairings, and experiments will continue with the rest of this package. Welcome to Day #4 of Chocolate, Cherry and Berries Theme Week. Today's Chocolate Cherries were from California Sungold Pistachios (Oakhurst, CA). Under the glossy, cherry-colored shell of these confections, white chocolate and milk chocolate surrounded a dried cherry center that maintained some natural cherry flavor and dried cherry texture. 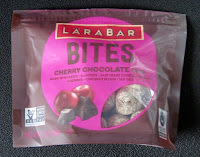 Welcome to Day #3 of Chocolate and Cherries Theme Week. 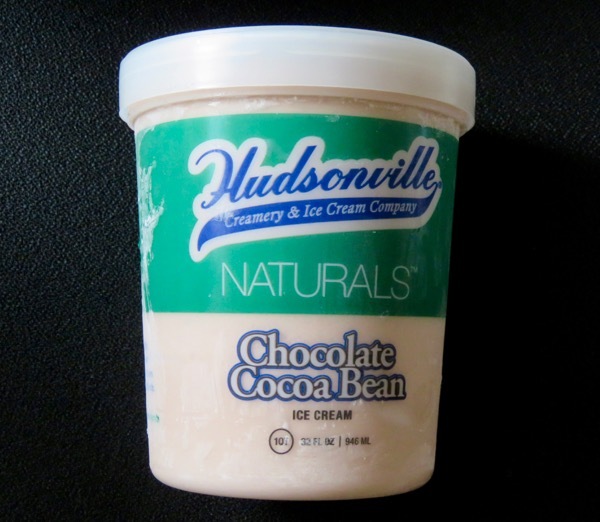 Today we cooled down with some cherry-related items combined with a scoop of Chocolate Cocoa Bean Ice Cream from Hudsonville Creamery and Ice Cream Company (Holland, MI). 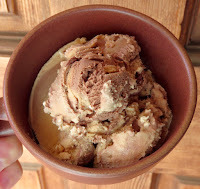 The Chocolate Cocoa Bean Ice Cream was part of the company's Naturals line, and was made with a list of 7 ingredients* and included cocoa that had been more minimally processed. 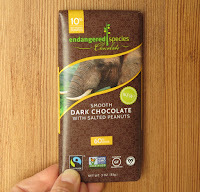 (Much of the bulk cocoa powder people buy has been treated (alkalinized) to reduce the natural acidic content of cocoa. This apparently was not.) 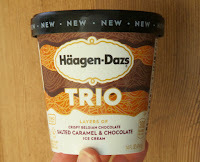 The chocolate flavor was still smooth. 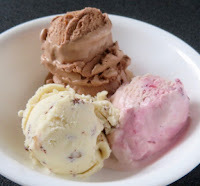 Perhaps the favorite, chilled cherry and chocolate ice cream combination of the day was a small scoop of Cocoa Bean Ice Cream with rum-soaked cherries. This dish disappeared too quickly to be photographed. 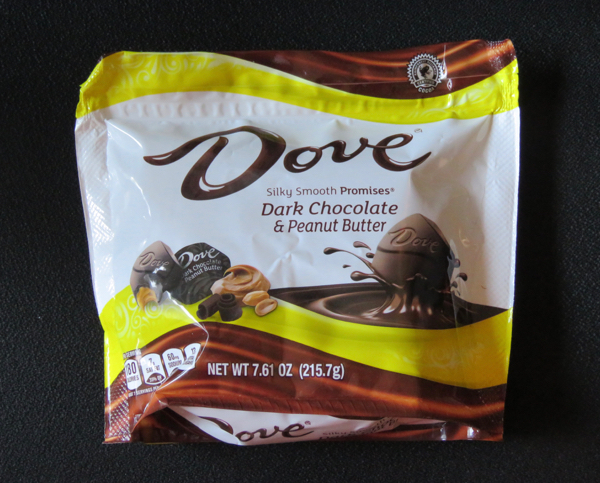 Welcome to Day #2 of Chocolate and Cherry Theme Week. 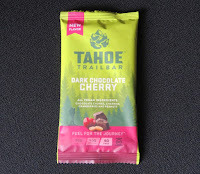 Today's Dark Chocolate Cherry Tahoe Trail Bar was distributed by King Bars, LLC (Reno, NV). 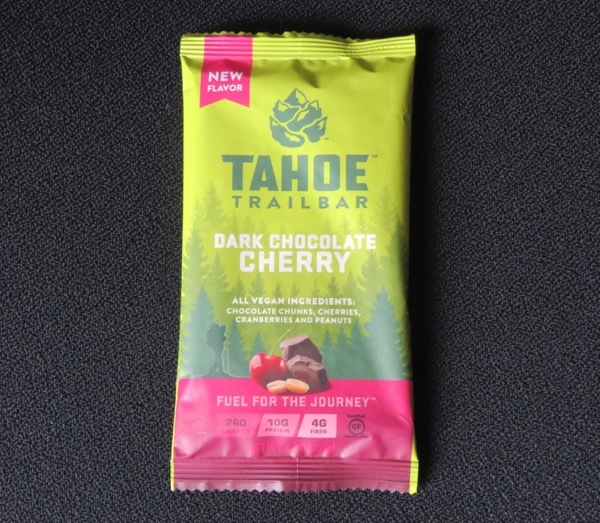 This chewy, mahogany-colored, trail bar contained brown rice syrup, gluten free oats, chocolate chunks, dried Bing cherries, soy protein, cranberries and peanuts. 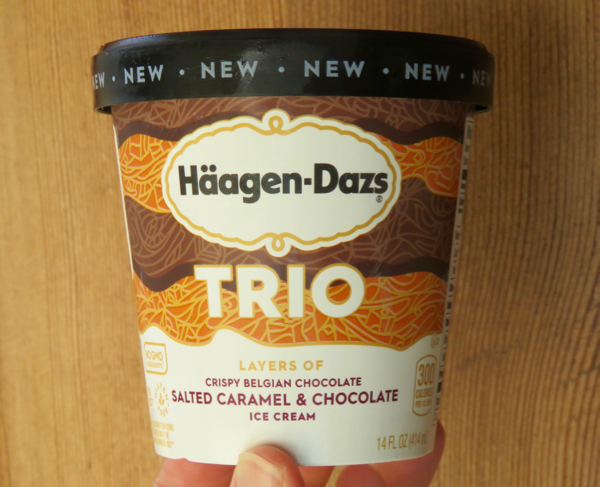 There was also a vague hint of spice/cardamom. 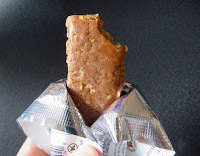 Not everyone cares for the taste and texture of soy protein. But, the chocolate, cherries and peanuts covered up most of that. 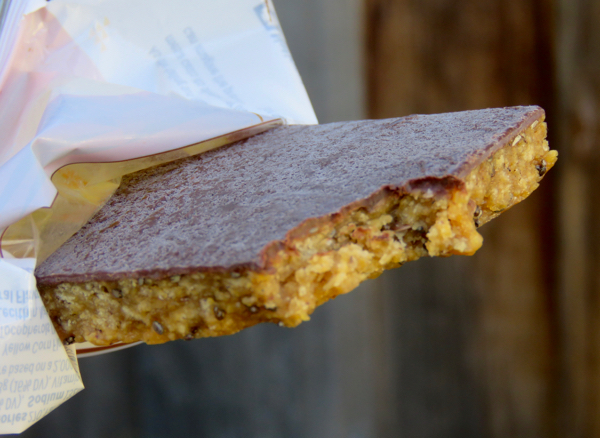 Certified Gluten Free and Vegan, this compressed bar contained 10 grams of protein. The tagline for this bar: "Fuel for the Journey." Good thing. 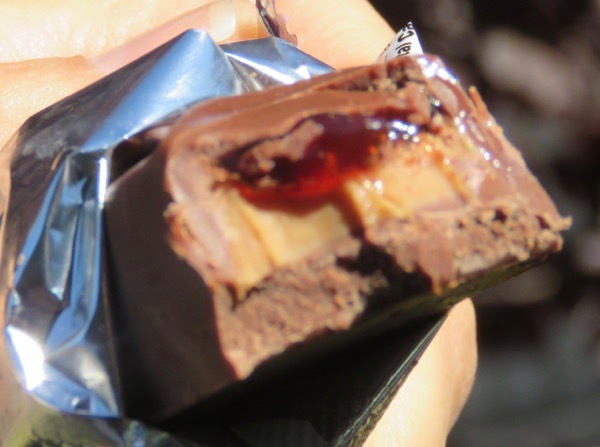 Most people need above-candy-bar-level fuel for their busy lives. 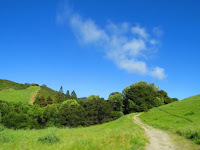 My current journey is to visit all the East Bay Regional Park District Parks in Northern California in my spare time; and it's been a deeply rejuvenating experience spending time in open spaces and observing scenery and wildlife.) Bars like this come in handy for hikes in the hills. 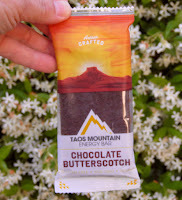 "I am inspired by the crunch of the dirt under my shoes, the sweet silence of skiing powder, and the journey of hiking to the top of mountain peaks." 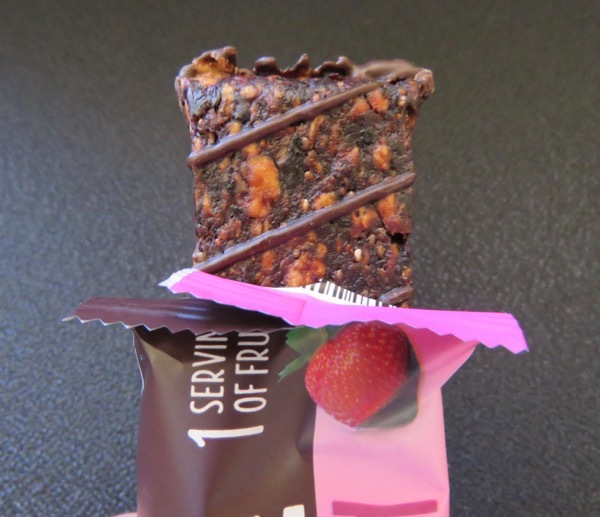 Welcome to Day #1 of Chocolate, Cherry and Berry Theme Week. 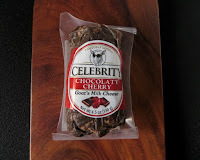 Today's Chocolaty Cherry Goat Cheese was from Celebrity Goat (Canada goat milk). What's that you say? Goat cheese? Think cherry and chocolate cheesecake, only slightly less sweet and a teensy bit cheesier. 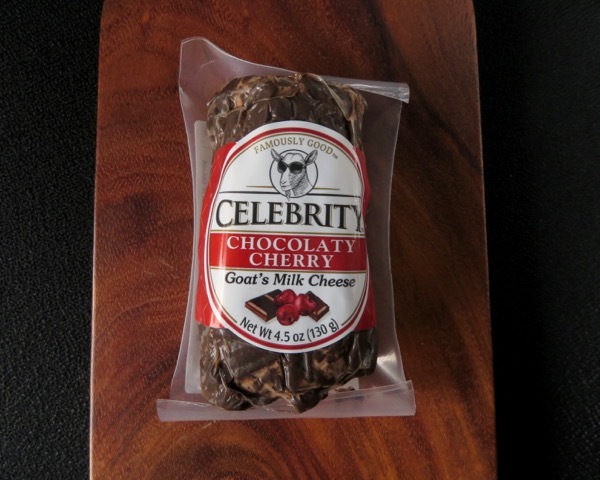 This petite, plump cheese log was made with cocoa-colored, creamy goat cheese, chocolaty bits (cocoa, coconut oil, sweetener), Dalmatia cherry, and assorted other ingredients* and preservatives. A few slices of this cheese would add visual interest to any cheese plate. Ingredients: Pasteurized goat's milk, sugar, partially hydrogenated coconut oil, cocoa, water, fructose, corn syrup, cherries, modified corn starch, mono and di-glycerides, salt, potassium sorbate, soy lecithin, fruit pectin, citric acid, lactic acid, ascorbic acid, microbial enzymes, bacterial culture, natural and artificial flavors. 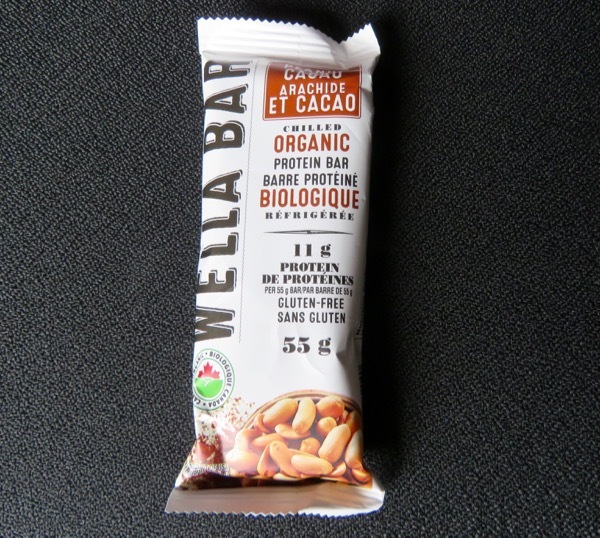 Today's Wella Bar (Peanut Cacao Chilled Organic Protein Bar) was manufactured and distributed by Lockhart Fine Foods (Lockhart, TX). This chilled gluten free bar was similar to the refrigerated Dark Chocolate Chip Peanut Butter bar by Perfect Bar (San Diego) also featured this week. 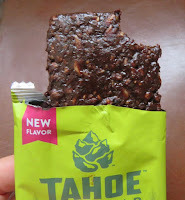 Both were quite good, and superior (in this reviewer's opinion) to virtually every protein bar on the market. 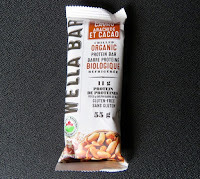 The Peanut Cacao Wella Bar was not overly sweet (the bar was sweetened with honey and maple syrup), and did not coat my teeth with a sugary coating (thank you!). 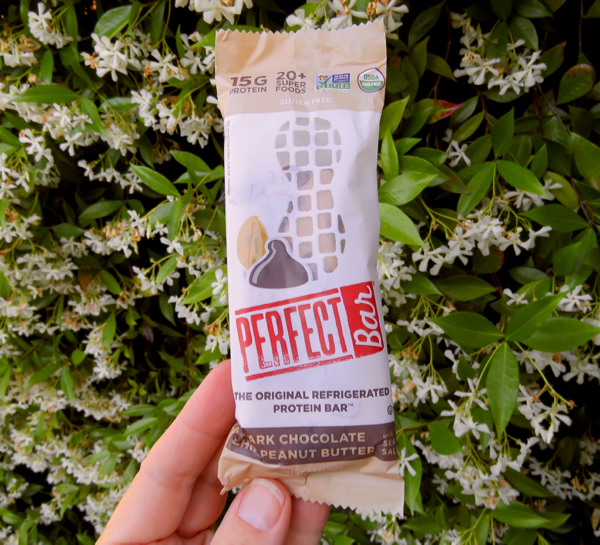 It contained 11 grams of protein (dry roasted peanuts, milk protein, dried egg whites, dry roasted almonds). 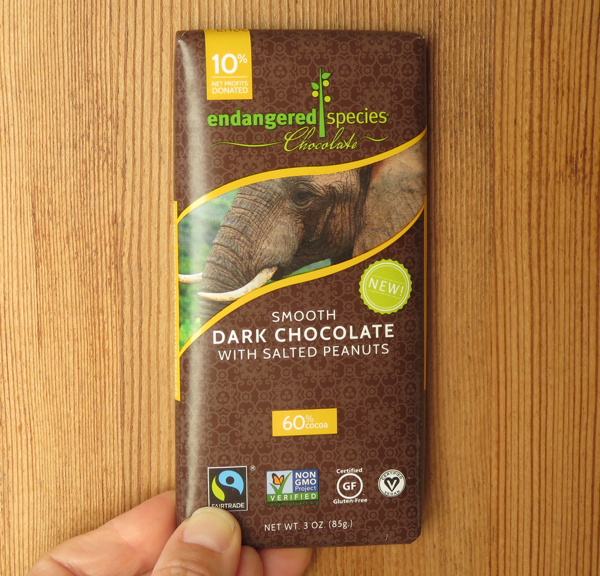 The cocoa powder incorporated into the bar provided added a hint of richness/chocolate flavor. Many of us have wished for better, healthier versions candy bars for many years. 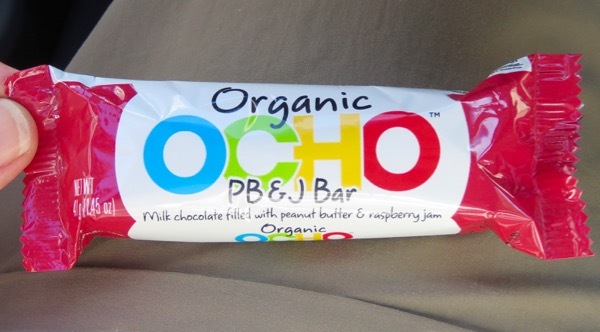 The founders of Ocho Candy had decided to create bars along these lines when they opened shop in 2011. 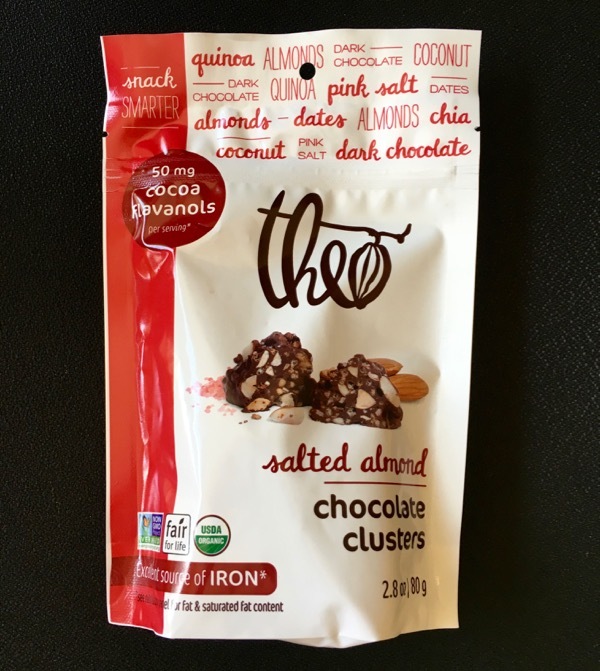 In a world where the imperatives of consistency and high-volume production can tilt products away from a short list of higher-quality (more expensive) ingredients, the Ocho lineup has proven that you can produce a better candy bar. 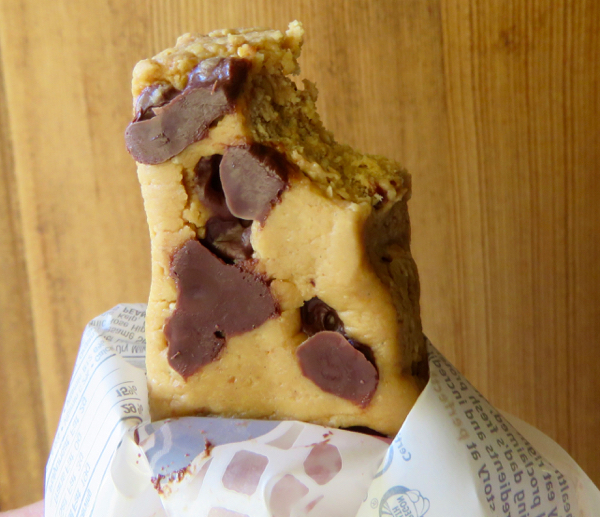 Certified gluten free, today's organic, milk chocolate covered PBandJ bar had authentic peanut butter and raspberry jam flavors and textures. Today's Dove Silky Smooth Promises Dark Chocolate and Peanut Butter chocolates were from distributed by Mars chocolate na, llc (Hackettstown, NJ). The aroma was that of sweet chocolate, and sweetened peanut butter (think Nestle Butterfinger candy bar). 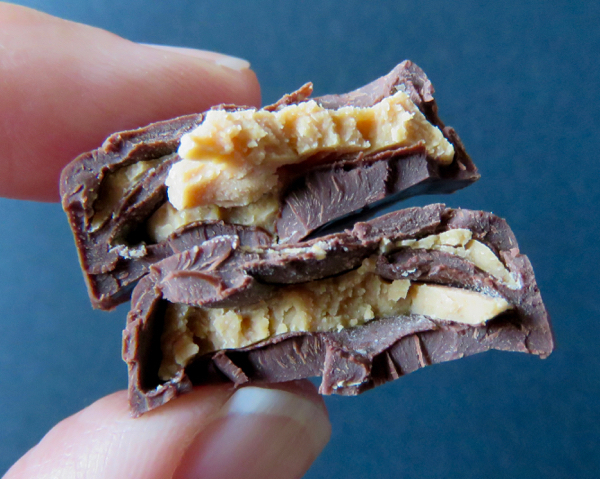 The flavor and texture will satisfy a mid-afternoon chocolate and peanut candy bar craving. 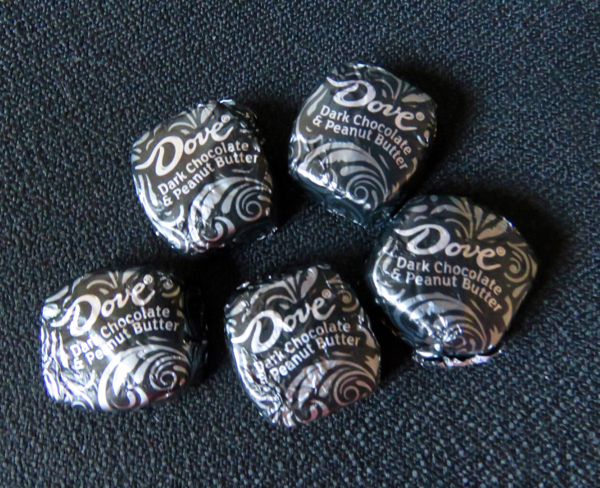 And, carrying on in the Dove Promises tradition, you'll also get a sweet message inside each foil wrapper. 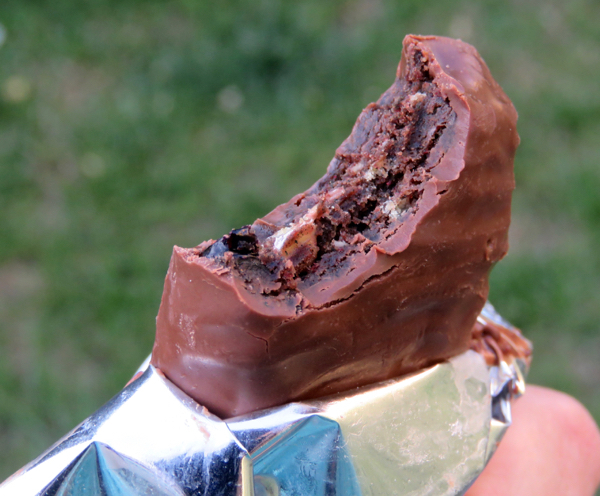 "Mars *Real* Chocolate." Interesting descriptive symbol on the label. With this long ingredients list* (see below), one wonders. 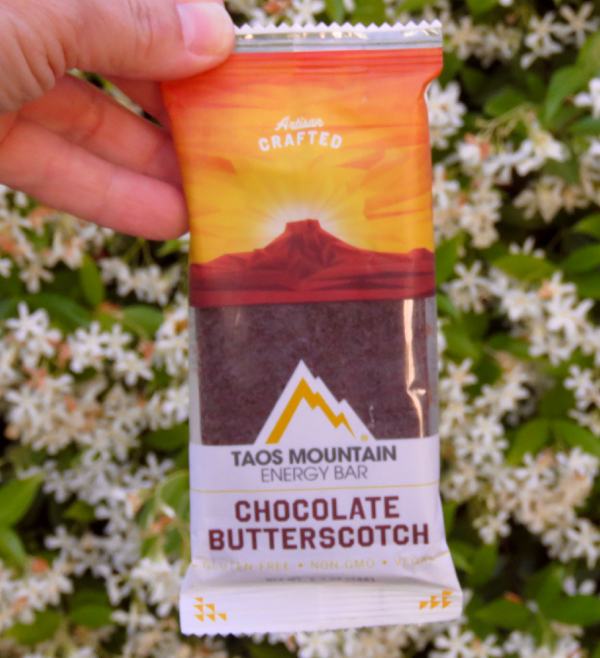 Real chocolate in our definition typically involves a shorter list of ingredients: cacao beans and sweetener—with a minimum of additives, flavorings, preservatives chemical acronyms and genetic engineering. Ingredients: "Sweet Chocolate (Sugar, Chocolate, Chocolate Processed with Alkali, Cocoa Butter, Milkfat, Skim Milk, Lactose, Soy Lecithin, PGPR, Artificial and Natural Flavors); Peanut Butter Creme (Peanut Butter, Peanuts, Palm Oil), Hydrogenated Palm Kernel Oil, Sugar, Partially Defatted Peanut Flour, Salt, Corn Syrup, TBHQ to Maintain Freshness." 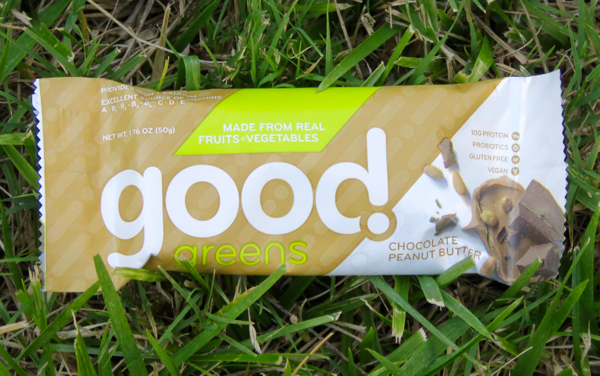 Seeing today's Chocolate Peanut Butter bar from Good Greens (Cleveland, OH) conjured up childhood memories of eating peanut butter and lettuce for some reason. 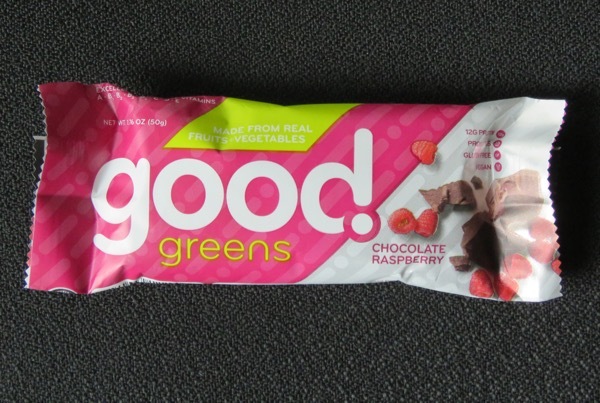 This bar, however, contained a blend of different greens and fruit (included in fine print)—and more natural vitamin content than many similar bars. 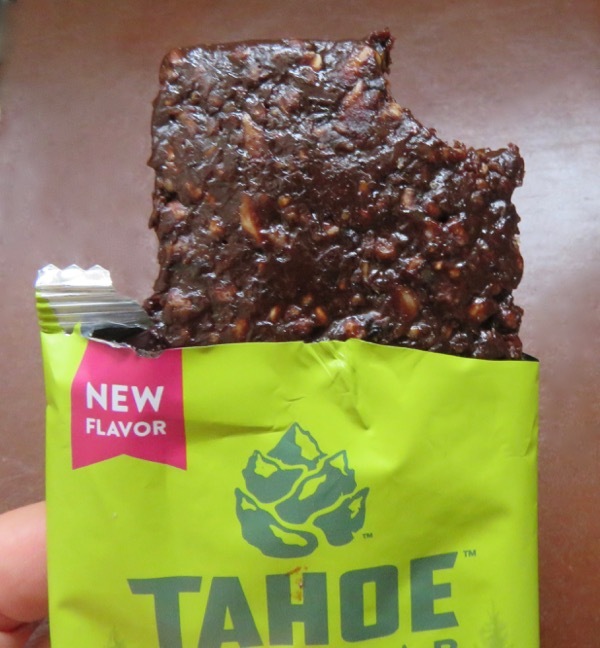 The bar also contained "natural fruit juices," grain dextrin and a few other mystery ingredients. 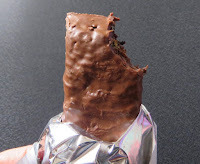 The dairy-free, chocolate coating was sweet tasting and soft/quick melt.